Krav maga is based on our most primitive and natural instincts. The Hebrew word “krav” means struggle and was first used in the Old Testament when Isaac wrestled with Gabriel, the angel of death. 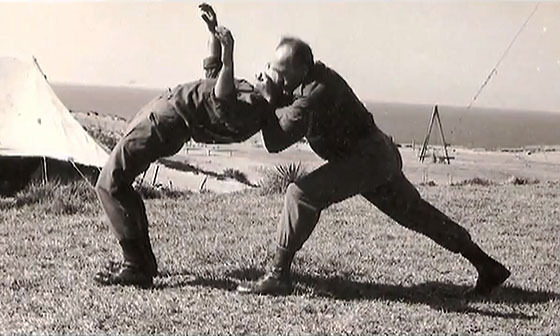 Although many Krav Maga building block techniques have existed for thousands of years, the self-defense system was developed, modernized, and fine-tuned during World War II and Israel’s War of Independence by Emerich “Imi” Lichtenfeld (Sde-Or). Born in 1910 in Budapest, Hungary, Imi grew up in Bratislava, Czechloslavakia. Imi’s father, Samuel Lichtenfeld, joined a professional circus troupe, where he excelled in both wrestling and boxing. After developing extensive knowledge in fitness training along with wrestling, boxing, and mixed-skill fighting, Samuel joined the Czech police as a detective and led the force in arrests. Samuel founded and ran the wrestling club and gym “Hercules,” where he trained Imi and other young competitive athletes. Imi rapidly distinguished himself as a champion in judo, boxing, wrestling, gymnastics and ballroom dancing, among other athletic pursuits. Imi also became a world-class gymnast, trained a ballet-dancing troupe, and starred as a stage show thespian in “Mephisto”. In 1935 Imi visited Palestine with a team of Jewish wrestlers to compete in the Jewish Maccabi sports convention. Unfortunately, Imi fractured a rib during a training accident and could not compete. This accident led to Imi’s fundamental training principle emphasized in his own words: “don’t get hurt.” Imi quickly concluded that only real necessity justifies a “win at all costs” approach. These two tenets eventually fused to create Imi’s krav maga training approach. Imi returned to Czechloslavakia to face increasing anti-Semitic violence. As Nazi hatred infected Slovakia, Jews were increasingly victims of near constant violence. To protect the Jewish community from marauding fascists and anti-Semites, Imi organized a group of young Jews to protect his community. On the streets, Imi quickly learned the vital differences between sport martial arts competition and street fighting. While serving on the front lines to protect his community, Imi began to combine natural movements and reactions with immediate and decisive counterattacks. These community self-defense activities made Imi a wanted man by the fascist Nazi occupational authorities. Nazi intolerance soon quickly reached a crescendo as the Germans began their systematic extermination of European Jewry. In May 1940, the Beitar Zionist Youth movement invited Imi to join them on the riverboat, Pentcho, bound for Palestine. Imi steamed down the Danube through the hostile, yet unoccupied banks of Hungary, Croatia, Yugoslavia, Bulgaria, and Romania and then into the open Black Sea through the Turkish Straits. He and other refugees survived the hardships of man and nature, including a quarantine intended to starve them while marooned on the Romanian delta. Imi showed his selflessness by plunging into the water and saving a drowning child. Consequently he developed an ear infection that would plague him throughout his journey. Upon entering the Aegean Sea, the Pentcho’s engines failed, grounding the boat on a desolate island. Imi and three other refugees took a life boat and rowed for three days. Imi’s ear infection gradually worsened and became life-threatening. A British airplane spotted them and summoned a British warship to rescue them. After receiving treatment for his ear-infection, Imi enlisted in the British supervised Free Czech Legion. After exemplary military service in the Middle East, Imi was released from the British Army following the German Afrika Korp’s defeat at El Alamain in 1942. Imi was granted permission to remain in British-ruled Palestine. His friends then introduced him to the leaders of the Zionist community’s defense organizations. Although Imi escaped to Palestine, his family remained behind. They all died during the war. Israel’s early leaders recognized Imi’s fighting abilities, innovativeness, and his ability to impart this training to others. Imi began training the Palmach (elite fighting units), the Palyam(marine fighting units), and the Hagana, which would merge into the modern-day Zahal or Israeli Defense Force. This training included fighting fitness, obstacle training, bayonet tactics, sentry removal, knife fighting, stave/stick fighting and any other military-oriented problems that required a creative solution. In 1948 Imi became the principal authority in close-quarters-combat for the Israeli Defense Forces (IDF). He was in charge of training a disparate group of soldiers of all shapes, sizes, and abilities, many of whom did not speak the same language. He needed to develop a self-defense system that would work for not only spry eighteen-year-olds and elite fighting troops in prime physical condition, but also for middle-aged and graying reserve soldiers. He needed a system that soldiers could learn quickly, during their 3-week-long basic training. Finally, he needed a system that worked, one that soldiers could apply to any situation at any time intuitively and without hesitation. Until the World War II era, traditional self-defense techniques left soldiers ill prepared to defend against armed attackers. As the fledging Israeli state formed, Imi knew its soldiers needed to learn a type of close-quarters combat that could protect them against firearms, explosives, and other modern threats. Thus, Krav Maga—the world’s most effective close-quarters combat system—was born. As he developed the method, Imi worked tirelessly to ensure Krav Maga success was not dependent on a practitioner’s strength or expertise in any one combative including punching, kicking, grappling or throwing. He took all aspects of a fight, both armed and unarmed, into account. Until the advent of Krav Maga, self-defense and close-quarters combat were thought of as two distinct methodologies. Self-defense usually included situations in which a defender was unaware of an impending attack. In close-quarters-combat, two opponents are aware of the other’s respective movements and perceived violent intent. Krav Maga fuses the two disciplines into one fighting system, giving you the tools you need to defense yourself both when taken by surprise as well as when you are well aware of your opponent. In Krav Maga, you’ll learn to quickly react under any situation. You’ll learn to both neutralize an attacker as well as develop a fight strategy that may include defensive posturing, and movements, coordinated attacks and counter-attacks, and overall tactics.